Sheffield Hatters 2018/19: Back row L to R: Sarah Toeaina, Luiana Livulo, David Capper, Naomi Campbell, Helen Naylor. Front row L to R: Levke Brodersen, Nerea Inguez, Ana Santana, Alison Gorrell. For that’s the time the women’s basketball team tip off against Sevenoaks Suns in the final of the WBBL Cup at Arena Birmingham. The Sheffield competitors are through to the final for the first time and will be looking to bring the trophy home to Steel City. 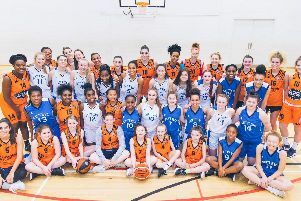 Hatters are going great guns in the league and could settle the first part of a basketball double if they defeat Sevenoaks in the West Midlands. They are placed second in the table with Sunday’s opponents leading the way. Hatters booked their ticket to the final by defeating Manchester Mystics 93-63 in the semi-final while Sevenoakes over came Leicester Riders. The Sheffield women warmed up for their final showdown by defeating Durham Palatinates 60-52 on the road. And they almost had their title prospects dented by Durham but managed to slip past the North-East side to take a precious win. The result was in the balance throughout, with Durham strengthening their roster on the eve of the contest. But, Hatters had the standout player in Sarah Toeaina. She had been the difference-maker all game and Toeaina made a huge score inside the last 30 seconds that effectively sealed the deal for her team. Toeaina showed her class with a powerful double-double of 22 points and 11 rebounds. Durham needed a few more triples to drop in a defensively orientated contest, with 3 of 16 not giving them the extra edge they needed. Toeaina’s performance earned her a place in the weekly All-Star five team.